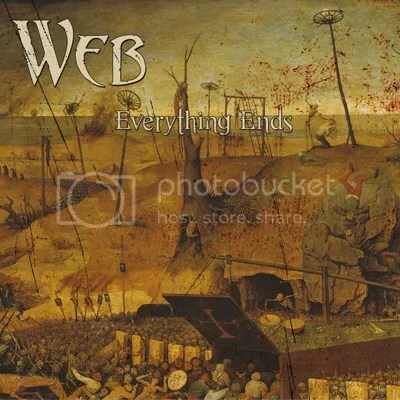 Within the first note of Web’s Everything Ends I’m dragged back to my teenage years of the late 90s. There’s an immediate vibe of The Haunted’s first two albums, mixed with Face Down, but there’s more to it than the sneaking suspicion that Marco Aro may have had a hand in the proceedings. If anyone else remembers one certain disbanded UK metal group going by the name Dearly Beheaded as fondly as I do, there’s plenty contained herein to tickle your fancy. There’s even a hint of the creepy, musically narrative atmospherics of Rage’s Black In Mind. Where this release excels in comparison to those mentioned above, is in production values. It doesn’t suffer from the testing ground that was late 20th century mixing and mastering experimentation, but has stepped beyond the bounds of the early stages of studio digitisation. The result is that it has both the chops from an era when individuality was celebrated rather than scorned, and the vibrancy of modern refinement in extreme music sound engineering. And it’s a rather pleasant result indeed. Web have actually been around since the mid-80s, so this is no contrived attempt to instigate a new phase of looking backwards in metal. These guys are the genuine article. They just happen to have not received the global recognition that some of their contemporaries have enjoyed. Unafraid to move through various changes of tempo,- including, but not limited to, mid-paced, double-pedal stomping – Web have a pretty wide palette to choose from within a tightly defined character. Comparisons are pretty easy in listening to this, but they are all good ones; influences worn with pride, perhaps, rather than stale carbon copying. This album is a human one, and shuns the pull and sway of current trends. Dark and energising at the same time, it is exactly the sort of music I couldn’t get enough of when I first got into anything heavier than Iron Maiden, but pumped up and turbo charged for the modern age. This entry was posted on 19th July 2015 at 11:55 am and is filed under CD, Metal with tags Doom metal, Everything Ends, Heavy Metal, Raising Legends, Thrash metal, Web. You can follow any responses to this entry through the RSS 2.0 feed. You can leave a response, or trackback from your own site.